A contemporary of the C64. One of the main selling arguments was that the processor was used in the space shuttle. 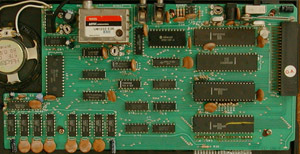 An RCA 1802. Note the small funny joystick right of the keys. ROM dump Eary 2008 I devised a way to dump the ROMs without soldering them out or make a custom interface for the COMX. By dumping the ROM in parts to a variable and write that variable to tape (DSAVE command), all that was needed was a WAV to BIN converter. Written in Perl. 9V DC, 800 mA max., pin is plus. 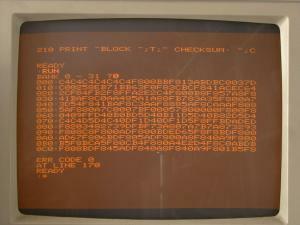 Want to build your own 1802 processor system, like the COSMAC ELF? Now there is an opportunity to get a 1802 processor cheaply, including two CDP1823 chips (128 x 8 bits). Look here. Review "Your Computer", August 1983 same review, different formatting. D.I.Y. Cosmac Elf. Also lots of documentation. 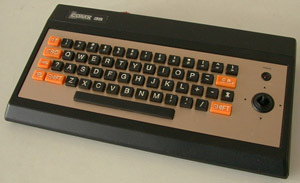 The 1802 was also used in the COSMAC "ELF"